View more collections held by DeGolyer Library. 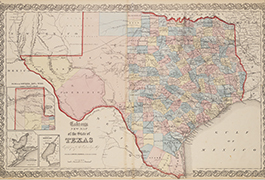 The Texas: Photographs, Manuscripts, and Imprints digital collection contains hundreds of photographic images, real photographic postcards, books, historic documents, and maps of Texas held by SMU’s DeGolyer Library. 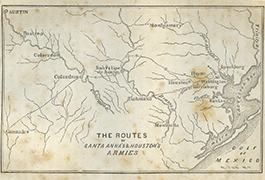 Each item includes information about Texas and Texas history. In particular, Texas: Photographs, Manuscripts, and Imprints reflects the state's rich history during the 19th and early 20th centuries. 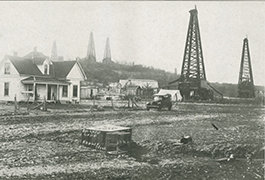 The digitized files in this online collection illustrate historical events such as the development of the Texas oil industry, relations with Mexico, the Texas Revolution, Mexican Revolution and Civil War. The collection also includes images of cultural experiences like the iconic State Fair of Texas and everyday life in the state. Collection of Adelsverein Documents. This collection includes 44 documents relating to the German colonization of Texas and the Adelsverein, also known as Society for the Protection of German Emigrants to Texas (Verein zum Schutze Deutscher Einwanderer in Texas). The Adelsverein brought thousands of German emigrants to Texas beginning in 1844. These documents include land grants, emigration contracts, promotional materials, and fiscal documents. 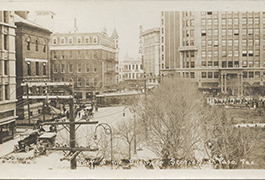 Collection of Texas stereographs: stereoviews that show various locations in/around Texas, ca. 1880s-1930s, including Galveston (during the 1900 hurricane), San Antonio, El Paso, Austin, Brownsville, King's Ranch, and more. 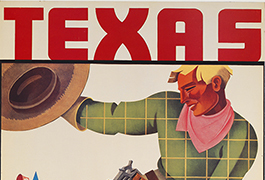 John N. Rowe III collection of Texas centennial and sesquicentennial posters. The Texas Sesquicentennial posters are re-creations of stamps designed for the 1936 Texas Centennial Exposition held at Fair Park, Dallas, Texas. The event celebrated Texas' independence from Mexico in 1836. Memorial on Behalf of the Citizens of Western Texas, Setting Forth the Grievances of the Loyal Union Men of that State..., 1866, a document referred to the Committee on Reconstruction, United States House of Representatives, petitioning for the creation of a separate state for Western Texas. This request is due to the area's pro-Union views during and after the Civil War and its mistreatment by the current state government. Pictorial Monogram of the State Government of Texas, 1873, H. B. Hillyer, Photographer. A composite photograph of the 1873 Texas legislators, including five African Americans, in the original frame. SMU Libraries has received funding from the Institute of Museum and Library Services through a grant to the Texas State Library and Archives Commission (TSLAC) as part of TSLAC’s TexTreasures program on multiple occasions. The Institute of Museum and Library Services is the primary source of federal support for the nation’s 123,000 libraries and 17,500 museums. The Institute's mission is to create strong libraries and museums that connect people to information and ideas. 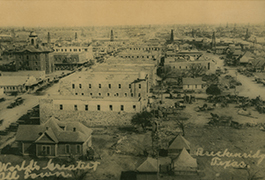 In FY2012, the grant funds were used to digitize a number of early Texas postcards. 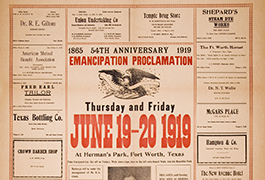 In FY2018, the funds were used for the digitization of a number of pamphlets, brochures, and books of Texas promotional literature.